When brass knuckles were finally banned, biker rings gained new meaning. ike most things that will land you a nickel at your local upstate prison, brass knuckles used to be totally legal. When Johnny Law cracked down, however, bikers found a way around the law. After all, you can't hardly make a law against guys wearing big rings, can you? Thus began the trend of big burly men wearing big burly rings. 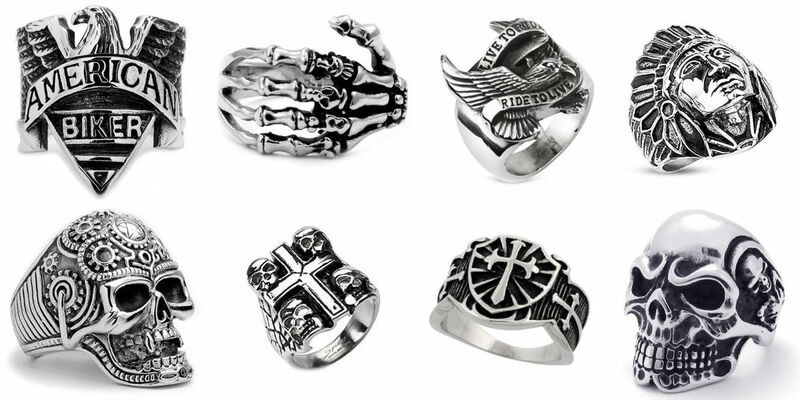 Known as "Mexican biker rings," these have moved outside the domain of bikers and into the world of collectors. Most of these rings were made in Mexico and no less a man than Elvis himself was an aficionado. Made primarily of silver and brass, it's easy to see why you'd want these for fashion or a collectible and not just an improvised knuckle-duster. Often made by small craftsmen, they have the look of artisanal design that's much sought after these days. What's more, the originals have a gorgeous patina about them that will attract attention whether they're sitting in a case or worn proudly on your fingers. A bit of history about these rings: At the end of the Mexican Revolution, the peso was basically worthless. As such, Mexican metalsmiths didn't think much about melting down the metal to make something more valuable, in this case rings. During the 1940s and 50s is when American motorcycle clubs discovered them on their regular rides to border towns. For the cost of about five American dollars, you could get your own Mexican souvenir ring that conveniently doubled as a legal brass knuckles. Themes aren't anything too surprising: You'll see Indian heads, Aztec warriors, anchors, horses inside horseshoes and, of course, the ubiquitous skull and crossbones. Turquoise also pops up a lot, as do Masonic themes and sometimes just good, old-fashioned silversmithing and artistry. Many of the rings don't have recognizable designs as such, just beautifully intricate metalwork. Images: 1,3,6; BABR. 2,7,8; The Selvedge Yard. 4,5; Sabrina Silver.